In a nation that worships at the temple of food and loves to travel, even virtually, it’s a no-brainer that gourmet theme parks would prove popular in Japan. Over the past decade, there’s been a parade of restaurant clusters grouped around a concept, from Odaiba Little Hong Kong and ShinYokohama Ramen Museum to Global Dining’s Glien Passage of Italian, Asian, Japanese and Mexican simulacrum. The one company that has really carved this niche deeply is Namco, the amusement company behind Ikebukuro Gyoza Stadium, Ice Cream City and Tokyo Dessert Republic and a handful of Sweets Forests scattered around the country. 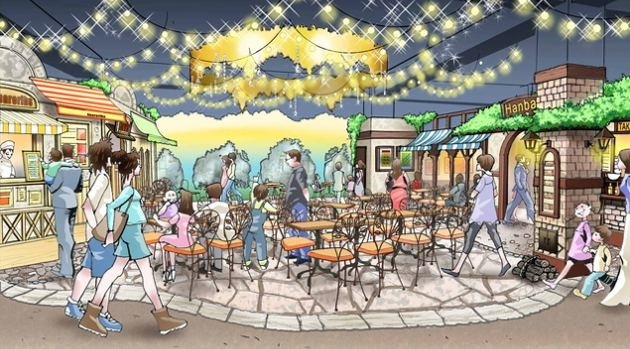 So naturally we’re curious to check out Namco’s latest culinary adventure, opening this winter in Hachioji City. The concept? A theme park that celebrates meat. Yep, you read that right. We’d like to imagine that this venture, named Miitorea, or Meatoria, or Meat Rare Meatrea, was the brainchild of meat industry executives and politicians fearful of the effects of asexual herbivorous men on the nation’s declining birthrate. But it’s more likely to be a case of Namco needing to check a neglected demographic off a long list. But you never know. Maybe they’ll go old school and serve up fresh horse sashimi or “hormone” meat (i.e. all the funky innards). Or even a Naruhodo za Miito corner dispensing haggis and chitlins. In its press release, Namco said Tokyo Meatrea’s interior would sport a “Spanish motif” and include a “town” section (oil-can grills, perhaps?) and a “forest” section (hunt for your own wild game?). 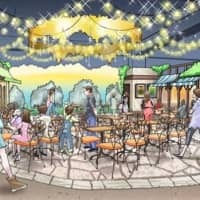 Now, of course, we all know that a fancy food court shouldn’t really be billed as a “theme park,” but at least Namco doesn’t slack on the wow factor. Like the new fantasy-world Vegas, Namco’s fabrications provide cheap fun and food for the whole family. We just hope that educational portion of Tokyo Meatrea doesn’t include a faithful re-creation of a slaughterhouse. Postscript: Tokyo Meatrea opened for business on Dec. 3. And no, we could have never predicted tokatsu parfaits. No, seriously.